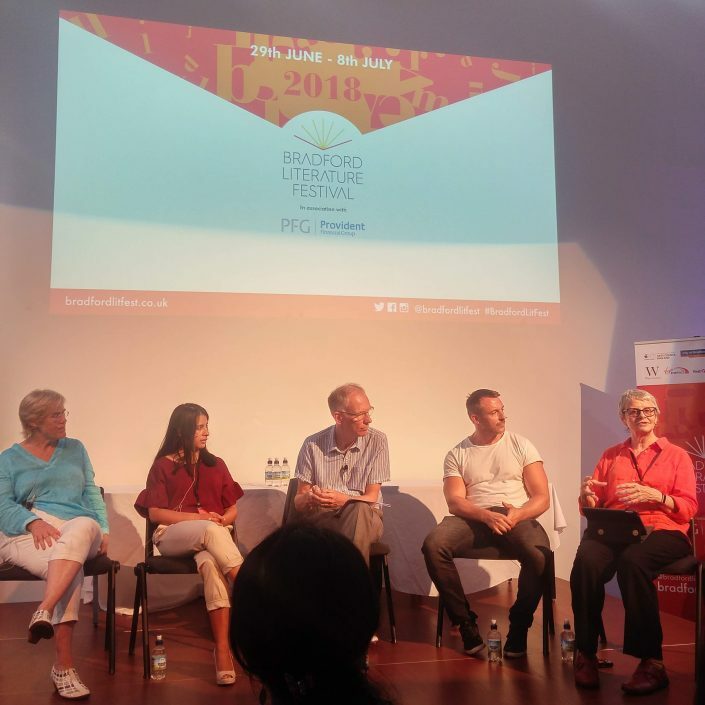 The Bradford Literature Festival first took place in 2014 with an aim to celebrate the written and spoken word. This year, a number of individuals from the University of Bradford are contributing to the vast array of sessions on offer. On Sunday 1st July, a panel discussion entitled ‘Living with Dementia’ was held in one of the Bradford College buildings. The emphasis of the session was that, whilst there are challenges associated with dementia, it is possible to live well with dementia. The topics covered ranged from the practical to the medical, with all four panellists expertly supported by the chair to share their views and opinions. Wendy gave lots of practical advice based on her own experiences of living with dementia. She spoke about the helpfulness of technology in finding her way around and also in enabling her to express herself more fluidly, as typing is easier than talking for Wendy. She also clearly acknowledged the importance of seeing people living with dementia as individuals rather than having a ‘one size fits all’ approach. Simon spoke about some of his past experiences with his dad and shared with great honesty details of how his dad’s experience of living with dementia has enabled the two of them to develop their relationship. Whilst there are clear challenges in knowing how to support his dad, Simon is able to create a fun and engaging relationship through music and song, something for which his dad has always had a strong passion. It was acknowledged by Murna that Simon represents many families who are trying their best to support a family member, but who do not always receive the support they themselves require from health and social care services. Murna is a true advocate for improving the lives of people living with dementia and their family members. She spoke during the session about the ways in which the research that is being carried out at the Centre can impact on the care and services that are available for people living with dementia, details of which can be found on our webpage (https://www.brad.ac.uk/health/dementia/research/). Jules spoke passionately about her role in diagnosing people with dementia and how she felt it would be beneficial for people to receive the diagnosis sooner. This followed on from comments by both Wendy and Simon who referred to lengthy time periods before a diagnosis of dementia was made. Jules had an excellent way of describing complex brain functions in a way that anyone could understand and was able to relate this to individuals rather than medicalising the diagnosis. After the panel discussion, there was an opportunity for the audience to ask questions. It was evident from the questions asked that the audience included some health and social care professionals, asking about how to ensure the implementation of good practice; as well as people with personal experiences of dementia, keen to hear about some of the practical ways to support a family member. One audience member was my mum, who has limited knowledge about dementia beyond what we discuss about my academic and practice experiences. My mum said she will always remember something that Wendy shared – that a smile can go a long way to help people be comfortable and feel that you are approachable. A smile certainly costs nothing but can make a significant difference to someone who might appreciate some support but who may be uncertain about whom to approach. One thing that really stuck with me was another comment that Wendy made about the need to normalise dementia, to feel able to talk about dementia without fear of stigma. Including such a topic as part of a literature festival is a fantastic way to do this, to raise awareness and promote discussion. I am grateful to the panellists for giving up their time to help to reduce the stigma associated with dementia and to share examples of how it is possible to overcome some of the challenges and live well. Thank you to Giorgia Previdoli, Noriko Tanaka and my mum, Fiona Glover for their contributions to this post.